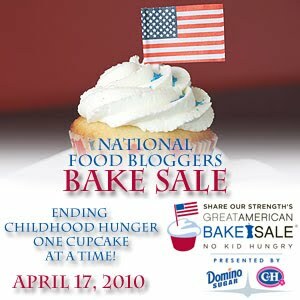 As part of Share our Strength's Great American Bake Sale, myself and food blogger's across the country will be joining together for the first annual National Food Blogger's Bake Sale. For more info on how you can contribute check out Share Our Strength's site. Look forward to seeing you all there!!! Shout outs to Colleen at Foodie Tots for puttin' it all together! **Update: It was great meeting/ spending time with other local food blogger. I'm so glad to share that we raised over $600 for SOS on Saturday! Everyones baked goodies were delicious!!! Dskco's Almond Pound Cake was awesome as was LivelovetoBake's Triple Chocolate Cake Balls and Mrs. Wheelbarrow's granola!!! I look forward to following you all!